For the better part of the twentieth century, Heil was one of Milwaukee’s major industrial enterprises and contributed to the city’s growing reputation as the “machine shop of the world.” Like many Milwaukee firms, however, Heil relocated to America’s Sunbelt states following the economic turmoil of the 1970s and 1980s. Julius Heil, a German immigrant arrived in Milwaukee at the age of fourteen, finding work as a drill press hand. More than a decade later in 1901, he set out on his own. The Heil Rail Joint Welding Company used electric welding technology to manufacture streetcar rails. By 1906 the company had shortened its name (Heil Company) to better reflect the broader range of steel products that it was manufacturing, including truck bodies, trailers, and hydraulic hoists. Operating primarily out of two separate plants on the South Side, Heil produced a variety of trailers used to haul everything from food and petroleum to solid waste. According to some sources, the company pioneered several new innovations in trucking, including the manufacture of the world’s first “electrically welded compartmental tank” as well as “the first stainless steel tank truck,” used for transporting milk (1927). 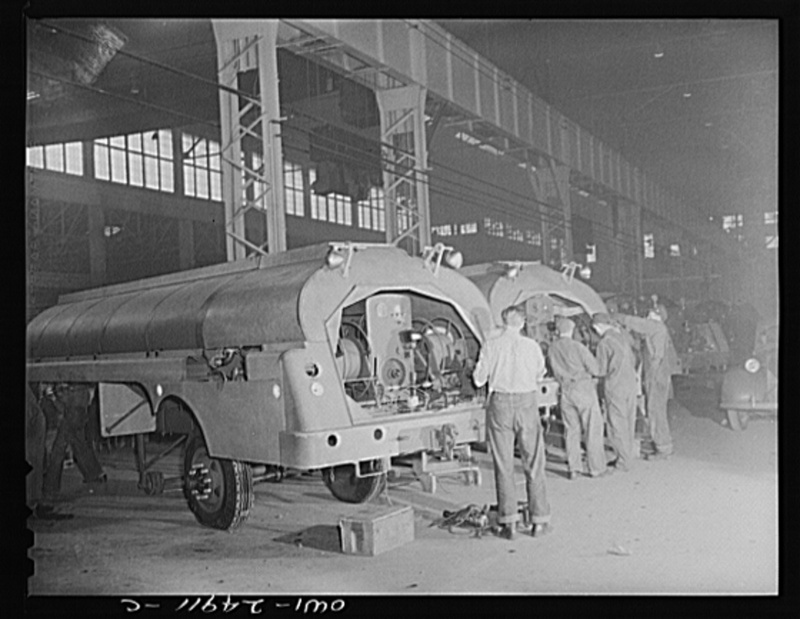 Just two years later, they also produced aluminum transport trucks that could be used to ship oil. During the Second World War, Heil earned several awards from the military for its aircraft refuelers, and truck and tank bodies. The company’s innovation continued after the war when it designed a molded fiberglass transport (1955) as well as an all-nickel transport trailer (1964). Such success spurred moderate expansion in the early 1960s as the company opened additional plants in Lancaster, Pennsylvania and Woodbridge, New Jersey. By 1970, Heil employed nearly 1,800 employees at their Milwaukee works and over 200 workers out of state. The 1970s, however, marked several significant shifts for the small, privately-owned corporation. 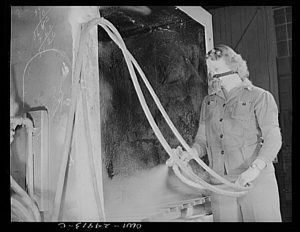 On a production level, the company responded to emerging environmental concerns by developing new “pulverizing” equipment—an essential part of their “‘milled’ refuse systems.” Such technology disposed of waste more efficiently and better served America’s burgeoning recycling movement. On a managerial level, the company was increasingly moving to sever its ties to the Milwaukee area. Citing a desire to cut shipping costs, Joseph F. Heil, Jr. (the third generation of Heil family managers) began decentralizing operations. The company opened new plants in Fort Payne, Alabama (1971) and Arab, Alabama (1973). In 1978, they traded their Milwaukee plant on 6th Street and Oklahoma Avenue to Rexnord in exchange for the latter’s plant in Athens, Tennessee. This new facility quickly became the center of Heil’s petroleum tank production. In 1977, Heil’s entire solid waste sector was relocated to Chattanooga, Tennessee. The recession of the early 1980s hit hard and further encouraged owners to cut back on production in their older plants and move operations elsewhere. It remained headquartered in Milwaukee until 1985, when the company donated its plant and property to St. Luke’s Hospital; after a few years of leasing office space locally, it moved all operations to Chattanooga. Purchased by Dover Corporation in 1993, the company remains a prominent name in the waste management industry, accounting for nearly one-third of its trucking products. ^ Joe Pecor, “Heil Co. Wastes No Effort in Stepping Out,” Milwaukee Sentinel, February 16, 1970, part 2, p. 10. Heil first lived in Waukesha but travelled to Milwaukee in 1890 to look for work. After serving as a drill press hand, he became a conductor for the Milwaukee Street Railway Lines and later an employee of Falk Co. Heil went on to become one of Wisconsin’s governors, serving two terms in 1938. He was succeeded as manager of the firm by his son, Joseph. Joseph’s own son, Joseph, Jr., then became president in 1968. ^ Pecor, “Heil Co. Wastes No Effort in Stepping Out.” See also “100th Anniversary,” Bulk Transporter, April, 1, 2001, accessed January 8, 2016, which notes the company’s earlier name. ^ Pecor, “Heil Co. Wastes No Effort in Stepping Out.” Pecor specifies three divisions at Heil, including the “solid waste disposal systems,” “highway transportation and material handling equipment,” and dehydration equipment, which was manufactured by one of the company’s subsidiaries, Arnold Dryer Co. The Milwaukee plants were located at 3000 W. Montana St. and 445 W. Oklahoma Ave.
^ “100th Anniversary.” See also, “Heil Co. Gets Trailer Order,” Milwaukee Journal, September 21, 1940, 8. According to the latter article, the company won a $2 million contract from the War Department to produce the bodies of tanks and refueling trucks that were used to keep the Air Force operational. ^ Pecor, “Heil Co. Wastes No Effort in Stepping Out,” 10. ^ Alvin L. Curtis, “Heil Co. Headquarters Alone Stay Rooted Here,” Milwaukee Sentinel, January 23, 1986, 5. According to another report, additional manufacturing centers were opened in Dumferline, Scotland (1973), Tishomingo, Mississippi (1978), and Tiftonia, Tennessee (1979). See Michael Fickes, “A Century of Growth,” Waste 360, May 1, 2001, accessed January 8, 2016, now available at http://www.waste360.com/mag/waste_century_growth, last accessed August 7, 2017. ^ Curtis, “Heil Co. Headquarters Alone Stay Rooted Here.” See also “100th Anniversary,” which notes the location of the company’s new headquarters.